I have a confession to make. It involves a basic failure on my behalf. What’s worse, my failure impacted students whom I care deeply about: students with dyslexia and other language-based learning challenges. It involved waiting for test results before putting accommodations in place for students who were struggling in my class. Of course I didn’t fail them intentionally, and by about the third time I got an evaluation back that pretty much said what I imagined it would, I started putting help in place for the student right away. The discovery of my own blind spot led me to wonder if other teachers were accidentally failing their students in similar ways. For many years, this is what I did: I would identify a student who was having problems, make some basic observations about what was particularly difficult for him, and then request further information about the student in the form of screening, special tests, and/or a learning evaluation. I would then wait for a report before taking further action. I am often haunted by memories of a particular former eighth-grade history student whose contributions to our discussions put him at the top of the class, but his written answers on tests and essays were always weak and minimalist and put him only in the high C range. At the time, I thought it was sufficient to label this descrepancy and recommend that he get a formal evaluation. I suspected a test would reveal that he was dyslexic. His English teacher concurred. Unfortunately, his father would have nothing to do with outside testing, so my brilliant student received low Bs in my class and never got the help he needed to express what he knew. But really, what was I waiting for? If asked, I would have responded that I needed more specific information about the student before I could know best how to support him. To many readers, I am sure that response sounds legitimate and reasonable. However, my confession is aimed at fellow teachers who will understand why my delay was unnecessary. I know that I am not alone when I admit that I can usually make general assumptions about what a learning evaluation is going to say before the results are in. 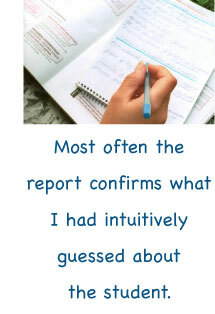 Most often the report confirms what I had intuitively guessed about the student. As personally validating and satisfying as that confirmation often is, it should not be a prerequisite to providing timely critical accommodations to my students. I need to be clear about something—I remain an enthusiastic proponent of testing and evaluations. Teachers are greatly assisted by the critical information that they yield. Outside testing provided by learning specialists offers a unique opportunity to isolate many classroom variables and specifically reveal and identify students’ academic strengths and weaknesses. Additionally, testing helps assess how extreme students’ gaps are, and what level of response is necessary. That information is a real gift to teachers, parents, and most importantly, students, and it is a gift that keeps on giving because tests allow future teachers to understand the student’s profile. Lastly, evaluations are required for students to qualify for accommodations on high-stakes tests such as SATs, ACTs and state exams. All indentified students should be provided access to them. Suggest the use of assistive technolgies, like E-readers, that read material aloud to the student. Suggest listening to audiobooks or identify a willing adult to read the assigned book to the student. Recommend that students read along with the audiobook version or to follow the words alongside the reader. The more often a struggling reader is exposed to the way they words look, the better. Exposure to the page helps students learn the architecture of sentences. This also helps with spelling and conventions. Suggest use of assistive technologies currently available that read material aloud to the student. The Kindle, the iPad, or Google’s Nexus tablet, would be examples of this kind of technology, but there are many similar devices being introduced into the market all the time. Click here to read a comparison of these tablets. If the book/content has been made into a film or covered in a film, suggest that the student watch it to help give a context to the story or content. Offer extra time to finish reading assignments. Dyslexic and struggling readers need more time to read assigned material. Provide class syllabuses in advance. Allow the student to read assignments ahead over the school breaks and the summer. This can help the student get a head start so that when the school year takes on its full momentum she is prepared and has had an opportunity to work ahead to absorb the increased volume of work. Recommend reading books with larger fonts. Hardback versions from the library are visually easier and E-readers offers the ability to adjust the font size as well. Recommend graphic novels. (Click here for a listing of kid-approved ones.) Graphic novels provide struggling readers with a way of strengthening their vocabularies, build their reading confidence, and foster their appreciation of story. Graphic novels can also help support a reader’s understanding of everything from Greek Mythology to Shakespheare.Dictating ideas to an adult can help a student get started with their writing by generating an idea bank that they can draw from. (They also won’t get caught up worrying about how to spell those words). Suggest that the student dictate an outline or brainstorm ideas to another adult (teacher or parent) who can record them. Depending on the circumstances, this can help students get started with their writing and help launch their ideas by generating an idea bank that they can draw from (they also won’t get caught up worrying about how to spell those words). Offer an opportunity to do work on a keyboard.If students are so labored in their handwriting and/or symbolic memory that everything they write is minimalist and/or incomplete, keyboarding can free up expression. Instead of worrying about what shape each letter is, the computer determines that for them. Word processing also helps record ideas in a standard readable font and allows a student to recognize more readily what they have just written. Note: if students are better served on the computer, have them immediately get to work on their keyboarding skills. This is not only a very important mechanical skill for all students, but also crucial for students who have handwriting issues. Suggest and/or provide the use of assistive technologies and software for help with spelling. Something as basic as Microsoft Word can help with regularly misspelled words. It is a huge relief for students not to have to worry about the correct spelling of every word. It corrects basic words automatically. Franklin Spellers or similar handheld devices that assist in the spelling of words are also helpful, particularly when students are not using a computer to write. Encourage the student to find a personal spelling strategy that doesn’t depend on memorization of word lists. Some students are never going to be spellers, regardless of their heroic outcomes on Friday tests. Take the time to reassure those students that spelling is a mechanical, not an intellectual, skill. Because misspelled words do negatively impact clarity, students need to understand that it is important to find ways to identify misspellings and correct them. Editing may involve using the spell check on a computer, a handheld speller, or a helpful peer or adult in their lives. Every poor speller needs to find his/her most efficient and effective proofreading strategies. The world is full of people who will judge students negatively if they turn in work with misspellings. Consequently, they must figure out how to get the help they need, aside from carrying the correct spellings around in their heads. Experiment with offering ways to provide EXTRA TIME… . Students who struggle often need extra time. In fact, sometimes, extra time is all they need. Is there a way to offer your student who lacks a formal diagnosis extra time in a way that doesn’t create equity issues or logistical ones? Aside from timed tests that are designed to check automaticity of a special skill, there are few instances that justify making speed more important than giving a student a full opportunity to express understanding. However, this can be challenging. Sometimes offering a chance for all students to return to finish an assessment up at recess, or during a study hall, is a way to make that work. Most often, students who do not need extra time will not take it. This is obviously an individual call because in certain situations extending the test time may raise the potential for cheating or equity complaints. Make it transparent to the student what is being assessed. Is it automaticity? Is it a spelling test? Is it understanding of the material? Is it a measure of writing skills? The student should be clear about what is being evaluated and so should the teacher. For example, if the student can orally explain what he or she knows, but cannot make that clear in writing, consider having the student demonstrate his knowledge orally, in addition to the written version. If testing for geographical knowledge and the student mispells many of the countries, yet it is obvious that he knows the correct answer, that should count. Conversely, if the student turns in a final draft of a paper with misspellings, penalties should stand. Students need to find effective editing strategies. Giving struggling students a pass in that situation is misleading and doesn’t ultimately help them. Provide typed class notes for students who can’t listen and write at the same time. This is not cheating. Some students need to focus all their attention on listening and attending to the information being explained. Writing impedes their ability to take the information in. If teachers are interested in facilitating an understanding of the content, then we need to be willing to do whatever is necessary to make sure that happens. Sharing notes can liberate struggling students to concentrate in class, while note-taking helps others consolidate the information through another modality. Students who use the teacher’s notes should also read them aloud into a recorder and play them back, discuss them, or rewrite them on their own time in order to reinforce their learning through another form of processing. Another modified option is to provide the whole class with a structured outline of the main ideas with room for students to fill in the rest (it also helps to model a note-taking format).Each student is different, but everyone benefits from processing information in multiple forms (listening, discussing, writing, drawing, reshaping, rhyming, applying, sorting, etc.). The teacher’s job is to help students identify how they process information most efficiently and effectively. Employing these strategies has allowed me to proactively help students reach the goals that I have set for the class. In many cases, these changes have been humbling as well as validating. For instance, when I allowed a child extra time on a test and discovered she did in fact know more then she had been demonstrating in the timed situation, or when a student brilliantly explained orally what he had failed to convey in writing, I felt thrilled for the student, but shamed by the missed opportunities to make earlier adaptations. Most importantly, these strategies help me address the access gap between the haves and the have-nots with learning issues in my class. Since no one can claim that every student who deserves accommodations is receiving them, I want to know that I offer my students who don’t have formal evaluations whatever tools they need to succeed, particularly when I intuitively know they need something different. I will continue to recommend formal evaluations whenever I can, but I don’t predicate certain accommodations on them anymore, and neither the gods of teaching nor my division head has struck me down for not waiting to help a student. See more study tips— from dyslexic students for dyslexic students.